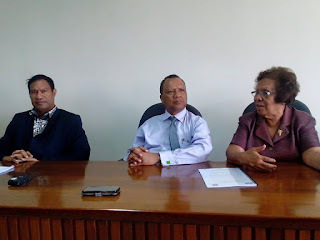 Papua New Guinea University of Technology (PNGUOT or UNITECH) announced a clean bill of health today during a meeting at the Auditor General’s office, Port Moresby. Present at the meeting were Deputy Auditor General Lemeki Ila, and representatives from the university: Chancellor Jean Kekedo, Acting Vice Chancellor Ora Renagi and Bursar Tharmaraj Diraviam (Raj). Mrs Kekedo stated that her term at the university was almost up and that she was honoured to be walking out of the institution knowing that her job was done. “When I was appointed on the university council, the first thing I found which was very difficult was that there were no proper audits done for many, many years and that our accounts section couldn’t produce the material that we needed to be able to make correct and legal decisions on our finances,” said Mrs Kekedo. She stated that it was a long road because in 2012 to 2014, the university’s audits were qualified which meant that there was a lot of work to be done. Mrs Kekedo further mentioned that with a clean bill of health, the university was able to partner with local and international business houses to become lucrative business partners. According the Deputy Auditor General Lemeki Ila, the university’s 2015 and 2016 audits were issued as unqualified or clean audits by the Auditor General. “UNITECH has come a very long way despite all its challenges because in the past, the university accounts were not that good as we have been issuing disclaimer or qualified audit opinions,” said Mr Ila.